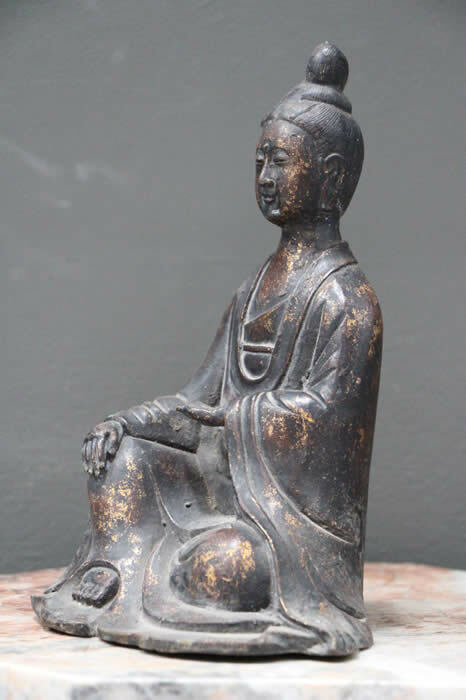 Antique gilt bronze Ming Dynasty Buddha seated on a pierced lotus ornamented pedestal with finely worked detail and traditional design. 18th century or earlier. 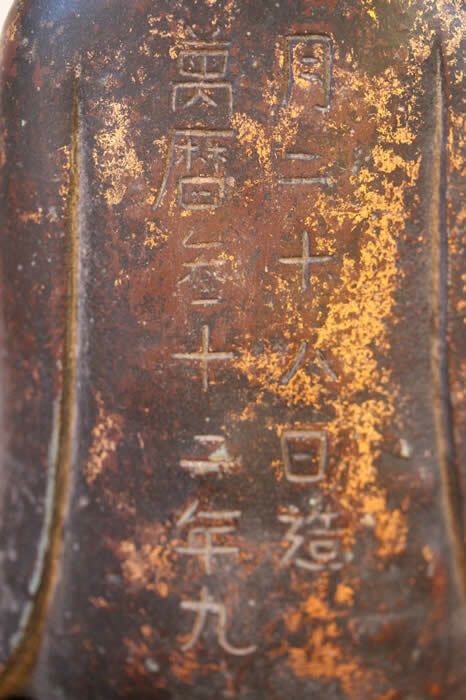 Impressed foundry mark or signatures to the back of this piece. Gold leaf tracery and original patina. 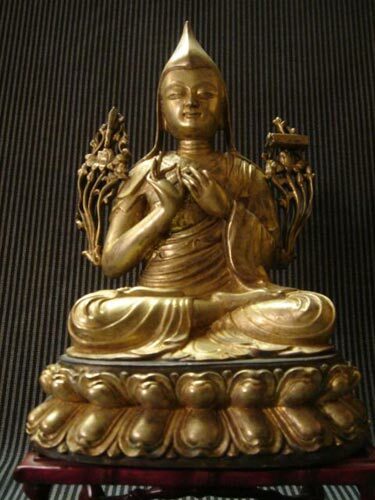 Superb quality antique gilt metal Goddess of Mercy bronze Buddha finely worked detail and traditional design in the 18th century manner. Signed to back with incised inscription but No foundry marks. Original gold leaf and patina. 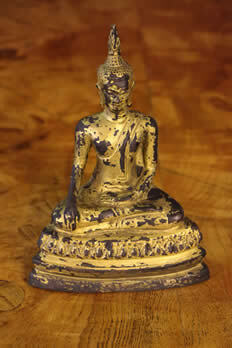 Antique 19th century gilt bronze Buddha statues finely worked detail and traditional design. 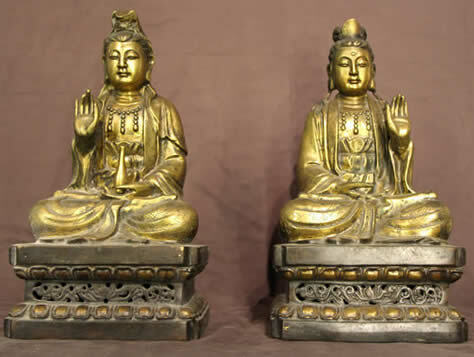 Rare pair of antique bronze Buddha statues seated on raised pedestals and with pierced metal work . 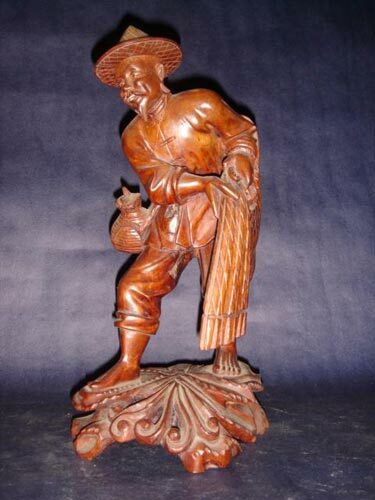 In the Ming Dynasty but most probably 18th or early19th century origin. Good detailed engraving all round and nice original patina. Heavy cast 4.7kg and 5.5 kg each One statue represents a general while the other represents the Goddess of Mercy Gung Yan or kwan yin.. 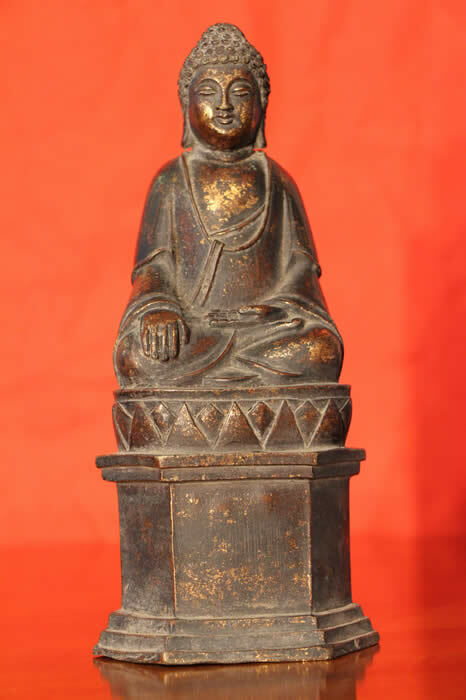 Antique gilt bronze Tibetan statue of a monk as a Buddha finely worked detail and traditional design. 19th century or early 20th centuryr. No foundry marks or signatures to date this by. Qing or Ching Dynasty period , beautifully worked details all around. 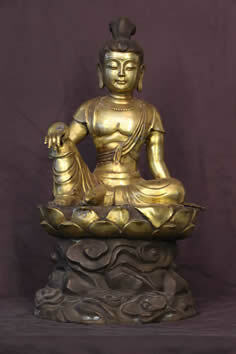 Antique Ming Dynasty Buddha gilt bronze statue seated on a flowering lotus pedestal.. The traditional costume sculpted hair with and dress with parcel gold leaf gilding of superb quality. 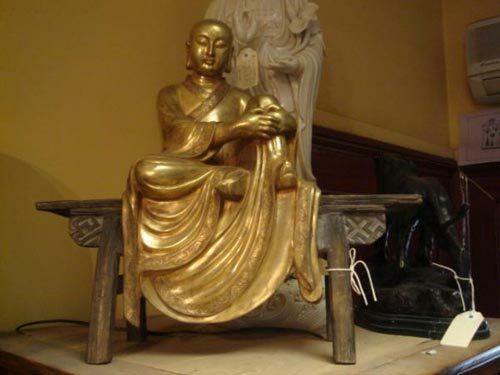 Chinese Statues of this age are extremely rare and highly sought after by collectors. 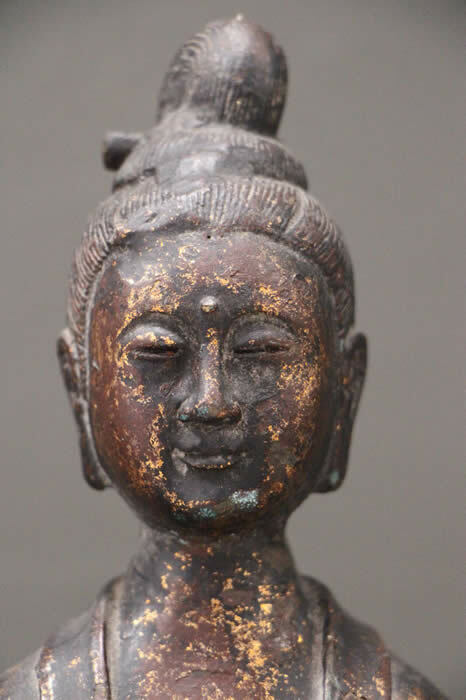 This very rare early 18th century buddha has beautifully shaped hands and long ears for longevity . 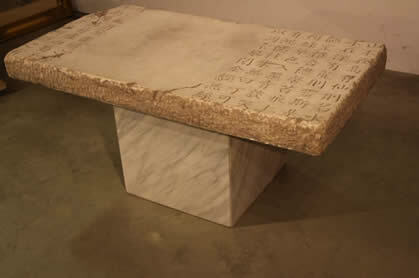 An unusual marble based occasional table with the top slab with an inscribed poem from a Tang Dynasty scholar. Perfect as a centre or coffee table or as a hall console table. The top has a marble appearance and is very heavy as it is a solid slab 8 cm thick. 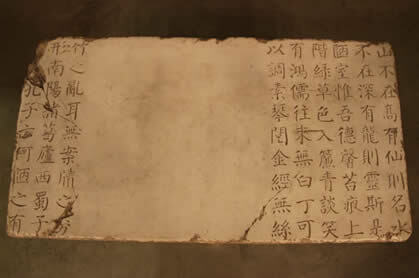 Traces of colouring can be seen in the inscription and on the rough hewn edges. The underneath surface of the slab has traces of mortar adhesion. 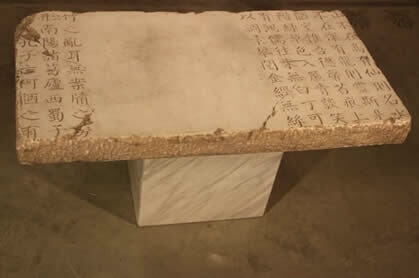 The white marble square base measures 41 x 41 x 40 cm . 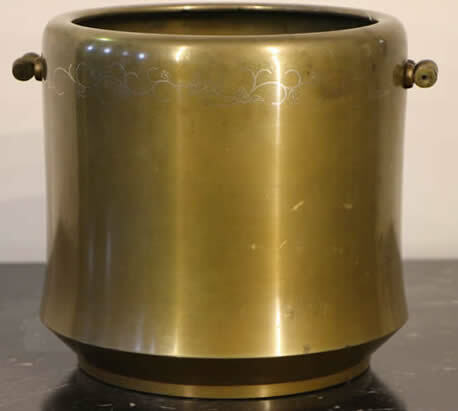 A solid bronze cast cauldron shaped large bowl of substantial weight of 3.6kg. The gorgeous shaped bowl with flared base and well rounded upper lid edge. 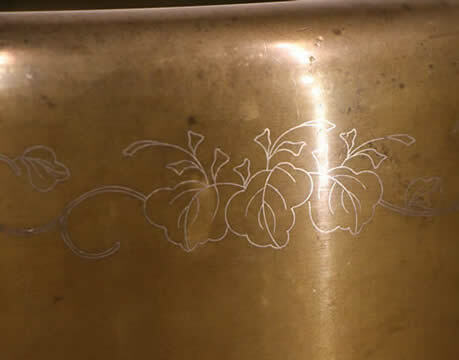 Below this lid is a banding on incised and silver inlaid floral design that joins the double handle lugs on each side. These ligs are applied with hand turned and wrought hand made brass nuts to the inside. 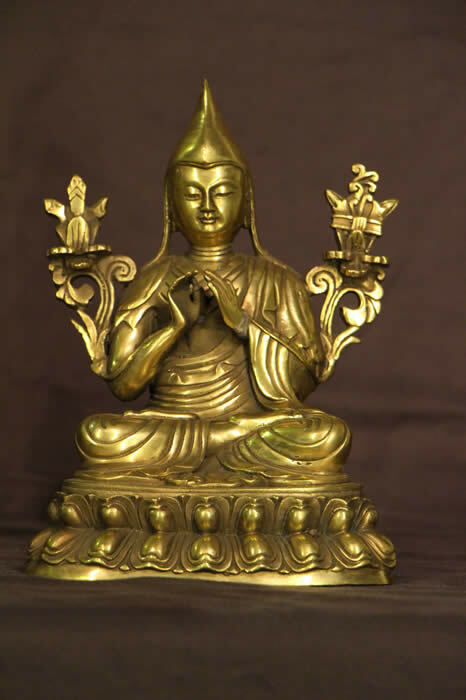 No signatured or stamps, consistent with temple or monastery pieces or very high quality. 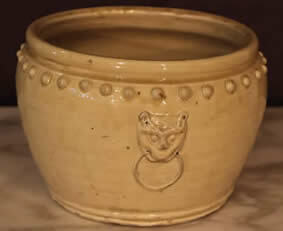 The shape, is an interpretation of the terracotta urns used to ferment suaces or contain wine, whereby the lid was fastened with cord through the handle lugs and a seal of clay , applied around these cords. Sometimes these caulron shapes are used in temples and filled with sand to hold burning incensence taper sticks. 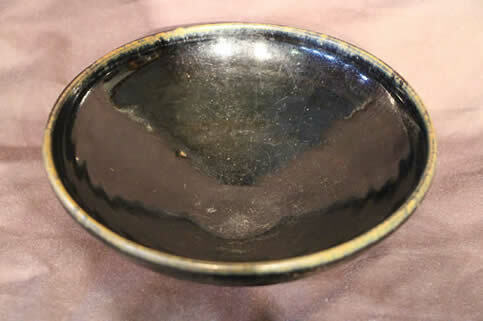 Black Glazed Chinese wine dish or serving bowl of large size. 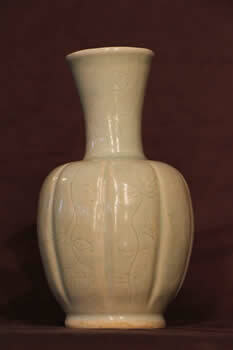 good condition with unglazed base. 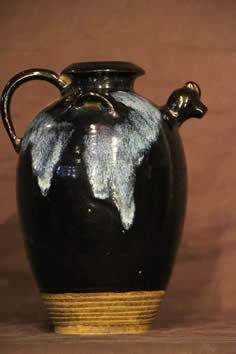 Black Glazed Chinese ewer or wine bottle with two tone glazing and beautifully sculpted cockrel spout. Unglazed base complete with blue drip glaze and twin tie lugs on each side of the handle. Glazed Chinese wine urn with glazed interior and two tiger's heads and knobbed rim. 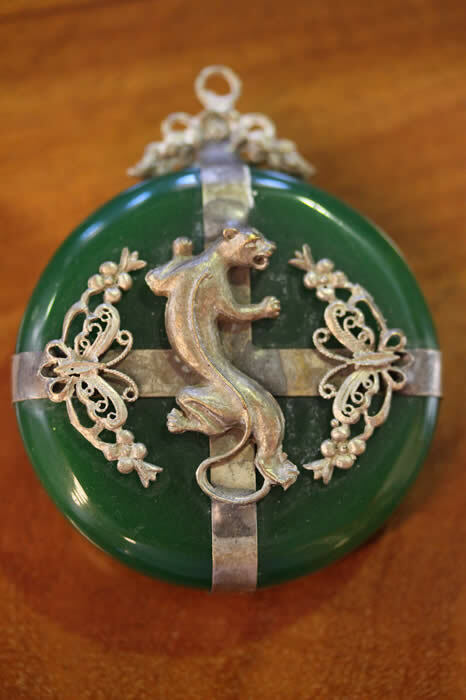 Chinese silvered filligrework metal mounted Jade like pendant with double sided motif of a crouching tiger, surrounded by wirework silver butterflies.  The top mount with a silver loop for suspension by a chain or silk cord. 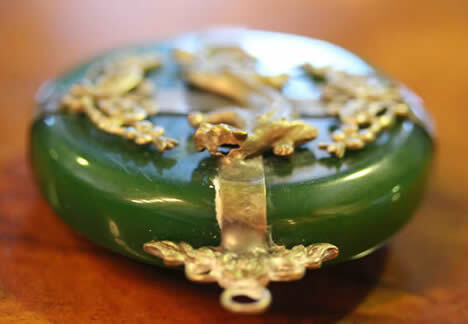 Superb quality green jade like stone disk with good patina. 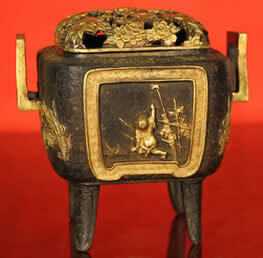 A well carved and cast bronze incense burner with different scenes to each side, highlighted in gilt bronze. . The lift off top lid is in solid bronze with gilt details of floral design. The angular handles to each side with carved meander pattern and gilt details with a stylised gilded dragon motif to body. 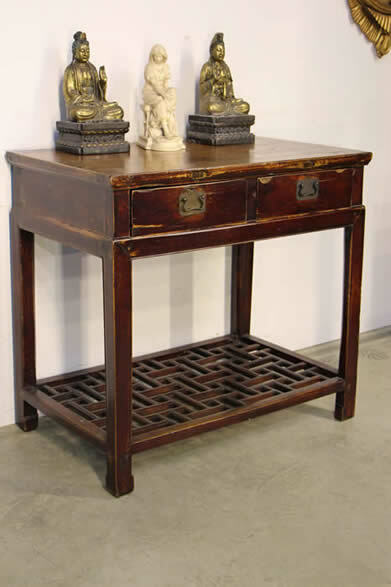 The whole raised on elegant Tang period style legs . 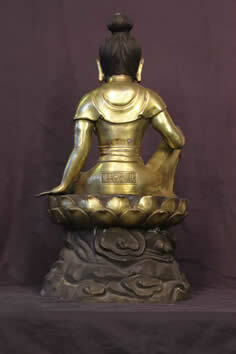 A very large statue in mercurial gilt bronze of the young goddess Kwan Yin or KWUN YAM, goddess of mercy. 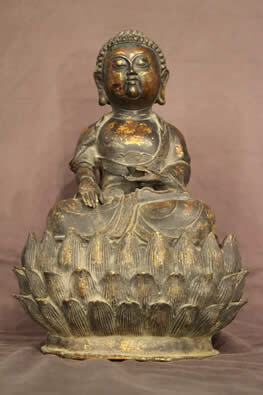 This Palacial sized bronze is finely worked with the state seated on a stylised LOTUS blossom. 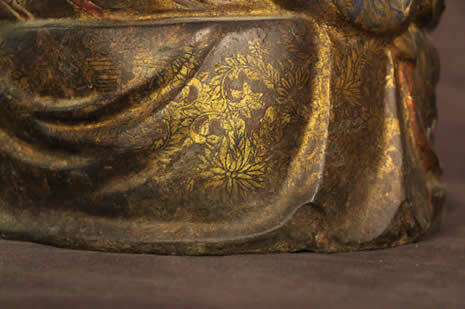 The figure retains its original MERCURIAL GILDING and is in very good condition. 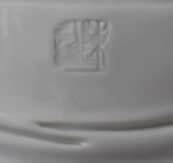 Origin, late QING, Ching dynasty China, palace quality. Great condition straight in the home, art gallery antique shop or temple. A rare beautifully made ceremonial mace in repousse copper and mercurial gilding. 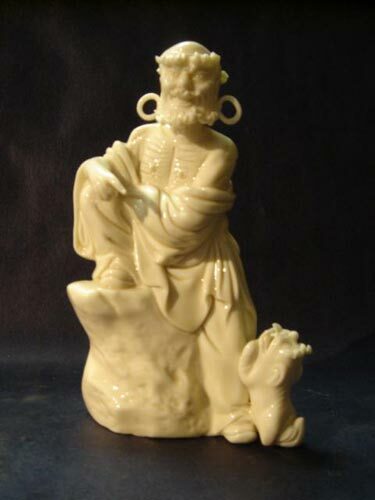 Apparently similar but smaller examples were brought out of India in the 1980's by an English Antiques connoisseur. This item is twice that size. 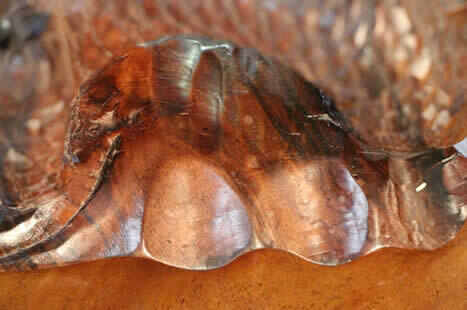 Hand beaten from sheets of copper or brass. The skills in this repousse work is formidable, working to form the image from the inside out including the well figured leopards head. Made in four sections and joined internally with hand cut steel screw thread. The entire piece is then mercurial gilded with real gold. 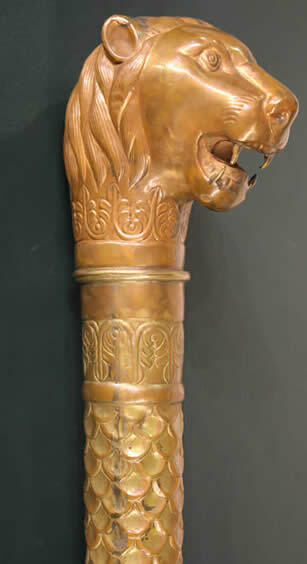 This type of mace known as a Soonta or souta was usually carried by a Souta berdar as part of the regalia of a Maharaja. 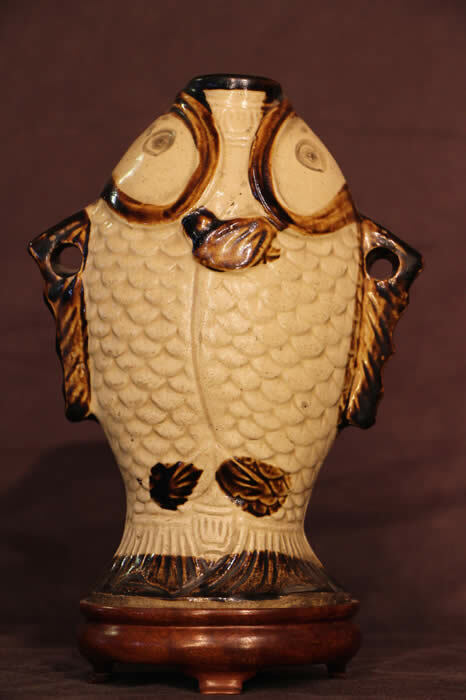 A similar example was sold by Christies in October 2011 in south Kensington for GBP 13,750. 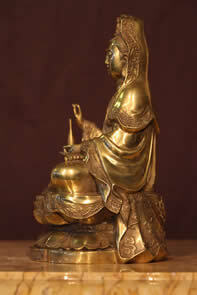 Description Antique Ming Dynasty Buddha gilt bronze statue seated on traditional lotus flower base. The traditional costume sculpted hat and dress with parcel gilding and tracery paintwork of superb quality. 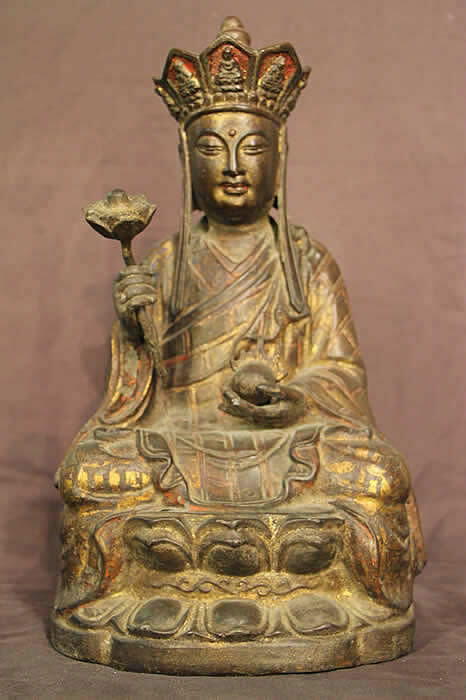 This very rare early 18th century buddha is complete with lotus flower in one hand and an orb in the other hand. 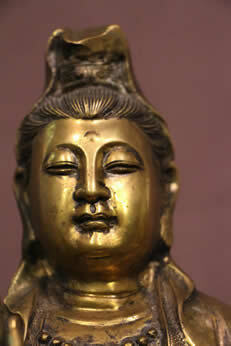 Description Antique Chinese QING, Ching Dynasty bronze Buddha finely worked detail and traditional design. Beginning of the 19th century or earlier. No foundry marks or signatures to date this by. Representing the thousand hands of the Goddess of Mercy . 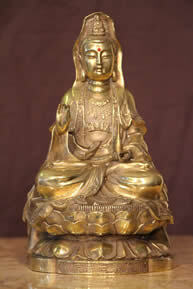 This large statue is cast in three sections, the lotus seat, the aora and the figure. it has been finely chisseled and well looked after. 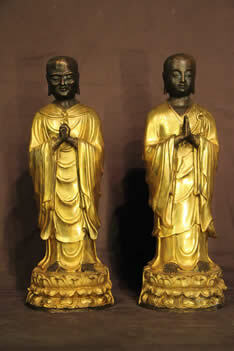 Beautiful pair of large statues in mercurial gilt bronze of the Students of Sakimuni, one young and one aged and wise. These Palatial quality bronzes are finely worked with the standing figures with hands in prayer. The figures retains their original MERCURIAL GILDING , encrusted with gold left behind after the mercury has been fired off and evaporated, and are in very good condition. Origin, late Ching dynasty China, palace quality. 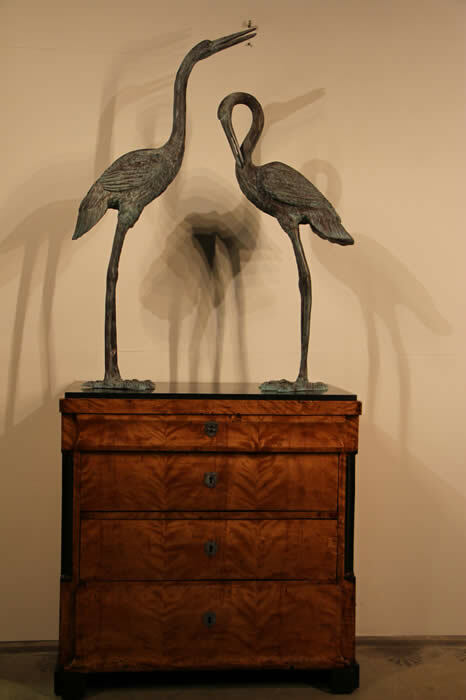 An impressive sized pair of solid bronze life size statue crane statues in courting posture. Beautiful antique green verdigris patina. 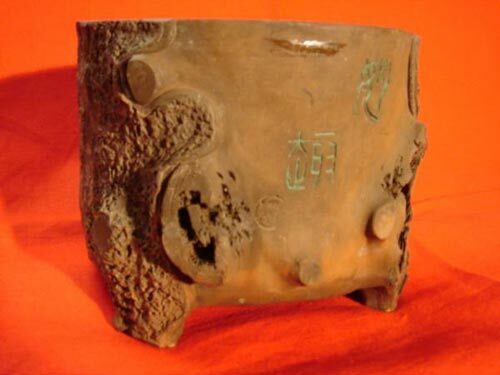 Perfect for indoors or in a fountain water feature, very heavy lost wax technique cast bronze. 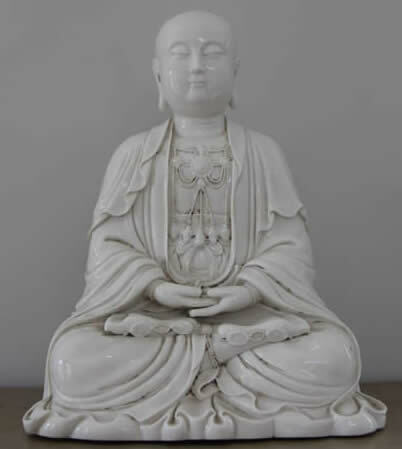 The symbolisim behind these gorgeous statues is from the asian influence of longevity and a long lasting marriage, which makes these a perfect wedding gift or ideal house warming present. 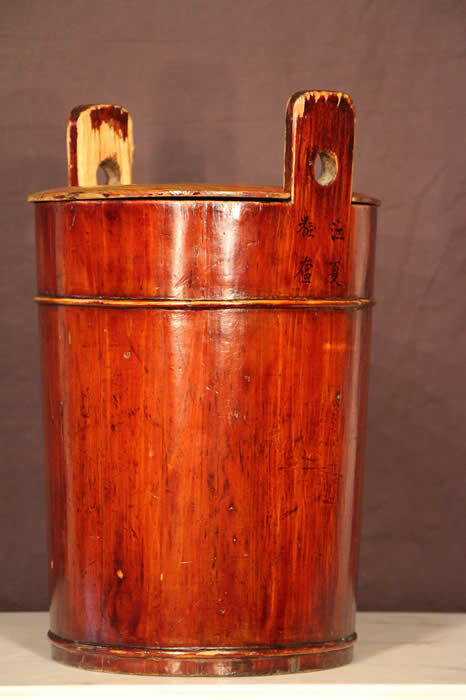 An Imperial China rice bucket or barrel , laquered interior and exterior and signed with four character mark to each side of the handle and on the inside of the lid. 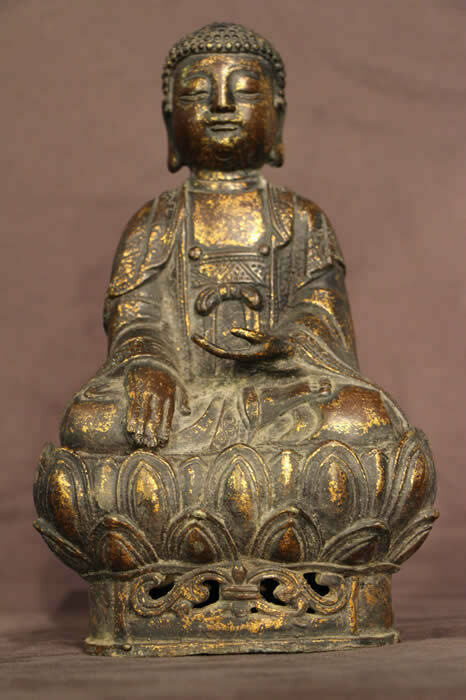 Antique gilt bronze Goddess of Mercy Buddha statue , finely worked detail and traditional design with jewelled forhead, late 19th century . 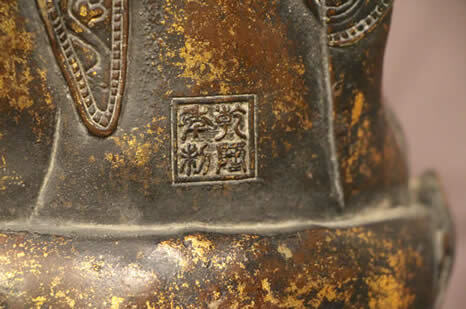 No foundry marks or signatures to date this by except for the inscription below her lotus pedestal. 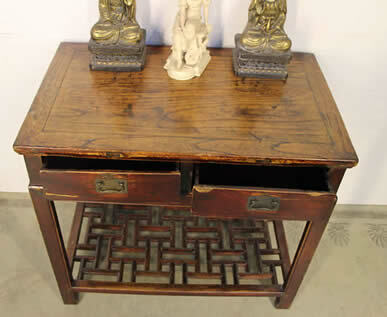 Qing or Ching Dynasty period , beautifully workedchisseled details all around. The statue bears an inscription to the base and has a jewell 3rd eye to her forehead. 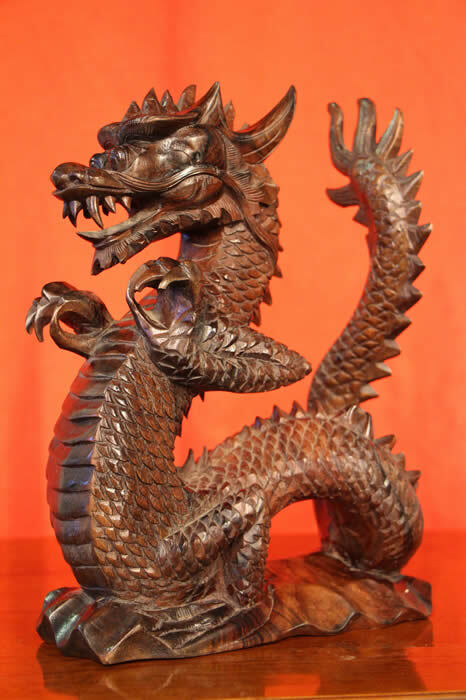 Antique Chinese dragon statue , beuatifully carved in heavy pallisander rosewood. Superb details in the sculpture and carving and completely original, no damage restoration or repairs. Lovely wood grain that really needs to be seen to be appreciated. This wood carver really understood the timber he was working with. 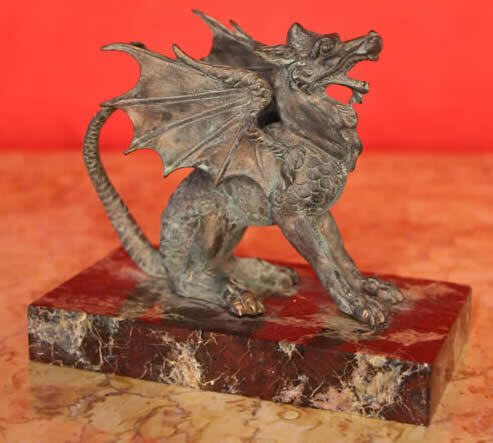 Gorgeous bronze Griffin or Dragon statue with stretched wings and firmly footed on a rouge marble base.. Fienly chisseled scales to the body and resting on four well carved paws. French made for the oriental gentleman collector. 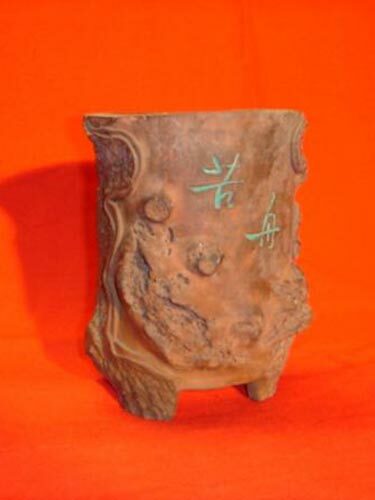 Description Chinese brush pot planted Signed Yee Hing, 19th century terracotta with naturalistic shaped treetrunk detail, finely pierced. 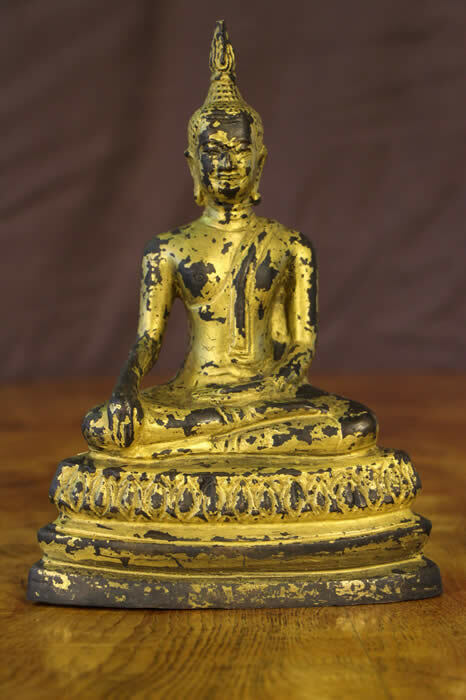 Antique late 18th early 19th century gilt bronze Buddha statue in the traditional Burmese manner. 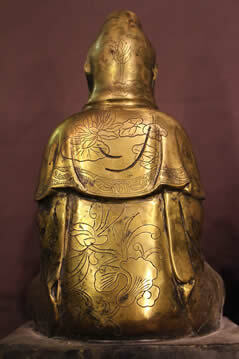 the heavy cast bronze metal covered in gold leaf decoration. 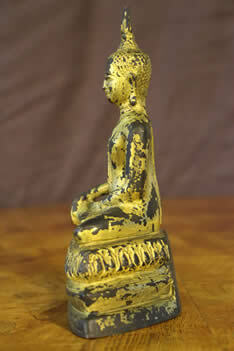 Seated in meditative pose on a stepped pedestal adorned with floral incised border symbolising lotus buds. 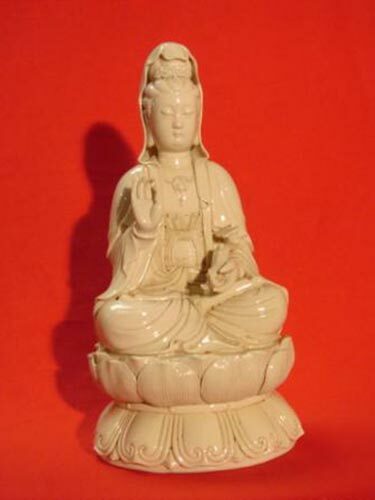 Description Chinese antique white porcelain Buddha statue signed by the artist to the back . This 1900's sculpture is unique and hand made and in perfect condition. From a collection of oriental antiques acquired by a connoisseur expat in Hong Kong over many years. 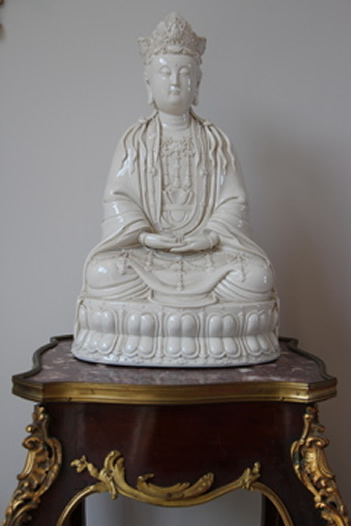 Description Chinese antique white porcelain Buddha statue signed by the artist to the back . This 1900's sculpture is unique and hand made and in perfect condition. 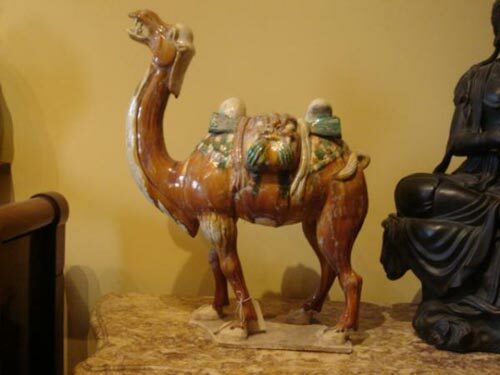 From a collection of oriental antiques acquired by a connoiseur expat in Hong Kong over many years. 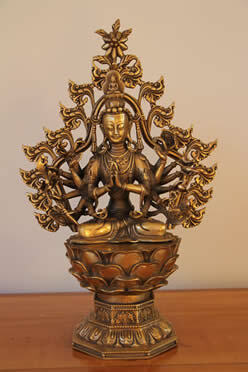 Description Antique gilt bronze Tibetan Buddha finely worked detail and traditional design. 19th century or earlier. No foundry marks or signatures to date this by. Mercurial gilt and patinated.